W.E.B. DuBois, The Autobiography of W.E.B. DuBois: A Soliloquy on Viewing My Life from the Last Decade of Its First Century, 1968. As he recorded in an autobiographical memoir written in 1939, Henry Laird Phillips was born in St Elizabeth, Jamaica, on March 11, 1847; he said he knew this because it was written in the family Bible. Unfortunately he did not use the same source to give any details about his parents. His family was Moravian, but his Roman Catholic grandmother had him baptised into her church by Father 'Duperong'. He wrote about his childhood in St Elizabeth in the 1850s, throwing light on the life of a country child, a century and a half ago. First remembrance of myself. How old? Don’t know. Mother puts pantaloon on me. What a great man I was on that day! As children, we had to work during the day. We have no short days and long nights as you have in North America. Days, 12 hours long. Nights the same. That pantaloon? Well, I remember when father gave me a little gun. I loaded it. Went out one day; rested it on a fence; fired at a pet camy (first cousin to a nightingale) and shot it. As I saw it fall, I threw the gun down, jumped over the fence; ran through the tall foxtail grass, and took it up! How did I feel? I felt that I was a great hunter like the mighty nimrod that we read about in the Scriptures. It is raining. We children are running about in old clothes. Now we are in the fields; now in the pond disturbing the ducks. What sport! Now we are carrying cane to the sugar cane mill. We carry everything on our heads. It is night. What little reading or studying we do, is done by candle light. Many a candle have I made. How? Take a bamboo joint. Fix your string so as to have it in the middle. Pour melted wax into it. Let it become cold. Split the joint open and behold your candle ready for use. Now you have “your dim and flaring light.” Of course, it is not electric light, but you have had the pleasure of making your own light - a pleasure that you can never get out of your use of electricity. Besides sugar cane, we planted ginger. When I was about 12 years old, in my spare time, I peeled enough ginger with which a horse was bought for me. Again I was a great man, riding on my own horse. We raised our own horses, cows, mules and donkeys. There was much pleasure in caring for them. But was it always pleasure? No. Life is not made up in that way. It would be monotonous if it were so. We enjoy light because there is darkness. Many a fall I have had from a donkey; many tears I have shed because of a stubborn mule or donkey. There was hard work and plenty of fun in selling ginger or sugar. The parish of Saint Elizabeth, where we lived, was some distance from any seaport town where we had to take our produce. Horses or mules took them in hampers. We may start one afternoon; travel half the night; unload; rest; reload and enter town in the morning. Returning had more fun for its, because we could ride home. Rum? We made plenty of Jamaica ruin, but I am not a “rummy.’’ Teetotaler then? Oh, no. I simply have no taste for liquor. Hence I hesitate to judge one who has. I am not tempted as he is. I must be careful how I judge. from the pamphlet in the Archives of the Diocese of Pennsylvania. In 1862 Henry Phillips was sent to the Moravian Training School at Fairfield, in the neighbouring parish of Manchester. He spent six years at Fairfield, and gives a very interesting account of how the students lived. He clearly felt he owed much to the very intense training he received at Fairfield, especially in how to live a disciplined and productive life. At the age of 15 I entered the Moravian Training School, at Fairfield, Manchester parish. That is some distance from the parish in which I was born. The climate is noted for its health-giving power. Though born in a Moravian family, one grandmother was a Roman Catholic. On that account (though how it was reasoned out I do not know) I was baptized by a Roman Catholic priest. How old was I? Do not know, but I was old enough to remember the appearance of the baptizer. I remember his long, black cassock and skull cap. Father Duperong [Dupeyron], he was called. The baptism was not in a church. I do not remember as a child ever having been in a Roman Catholic church. I went to a Moravian parish school and church. In 1864, at Fairfield School, I was received into church fellowship by means of a solemn and impressive service. That began my training for confirmation. I was confirmed October 14, 1866. The soul training was such as probably I could not have gotten anywhere else. 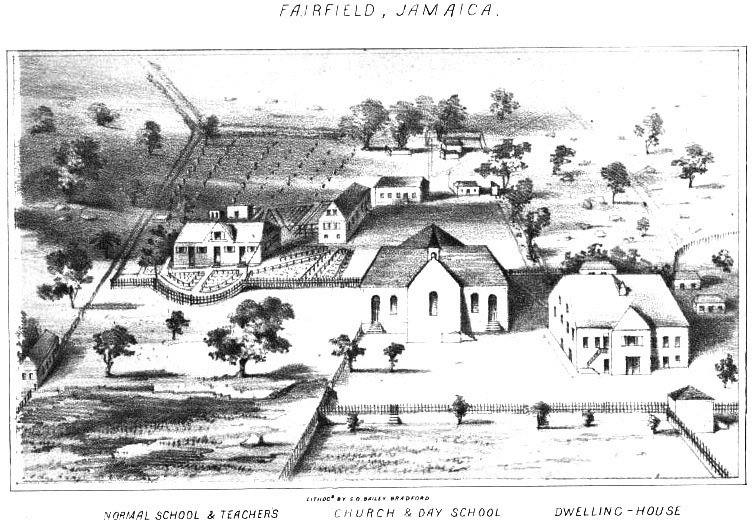 Fairfield Training School had a large number of acres of land. There were about thirty of us in the buildings. There was but one cook, and her place was in the kitchen. Servants to do the work? Oh, no. We were our own servants and there never could be any loafing. We got up in the morning by the clock. We worked by the clock. We ate by the clock. We studied by the clock. We went to bed by the clock. Everything about the houses and grounds was kept in a state of perfect condition. Every morning except Saturday, the most of us did some work about the grounds. But clothes had to be washed, dried and mangled. We did that. Sometimes wells went dry. We must bring water from the nearest place where it can be had. All kinds of fruits and vegetables were cultivated. Every student had a small patch of land given him. That he owned. On Wednesday afternoons, each student cultivated his own piece of ground. What he raised he sold to the institution. Not many of us, if any, had parents sending them money. Hence it can be seen how diligently each one cultivated his patch. Saturday mornings we did not work in the fields. What did we do? We swept the floors, scrubbed them, rubbed them with wax and then shined them. And everything had to be done in a perfect manner. There was a monitor going about, peeping into every corner to make sure that every spot was clean. Before that, all the cots and beds were taken out, sunned and cleaned. The afternoon was our own. Games, cricket especially, were played. Immediately after graduation I left home to teach school in St. Croix or Santa Cruz. It was then a Danish island. That was April 12, 1868. He graduated in 1868, and immediately went to teach in St Croix in the Danish Virgin Islands. After two years there he resigned and, against the advice of his pastor and friends who thought he should go to study in Germany, went to New York, arriving there on September 15, 1870. He went straight on to Philadelphia, which was to be his home for the rest of his long life. The school was started about 1839 in the house of Jacob Zorn, the Moravian superintendent, with three young men who studied 'the three R's', the Bible and gardening. F R Holland joined the staff in 1841 and carpentry was added to the curriculum; there were then 10 students. both illustrations are from J. H. Buchner's The Moravians in Jamaica, published in 1854.